Perennial evergreen herb, native to Western Asia, East and Southeastern Europe, naturalized in North America; rhizomes stout, woody, red; leaves in whorls of 4-6, papery to subleathery, lanceolate, lanceolate-oblong, or elliptic-oblong; flowers yellow to greenish yellow, rotate-funnelform, glabrous, tube ca. 1mm; berry black, 4×4mm. 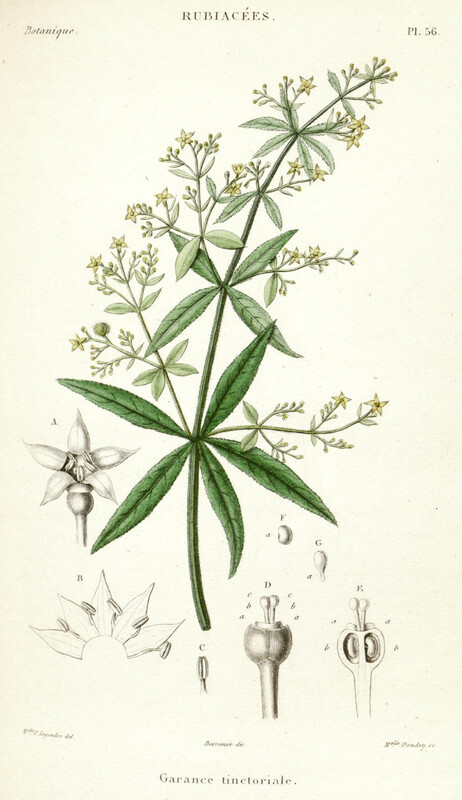 The admission of madder root containing drugs was withdrawn in Germany in 1993. Dried roots (Radix Rubiae tinctorum, Radix Alizari) are formerly used to treat diseases of the bladder and kidney, as diuretic and antidiarrhoeic. The roots contain anthraquinone glucosides (2-3.5%, mainly alizarin-2beta-primveroside, rubian) which are also absorbed when ingested, and the splittet off di- and trihyhdroxy anthraquinones are excreted through the kidneys. The urine gets a pink color; the substances contained therein have been considered anti-inflammatory and antispasmodic.